Kerry Ellis and Louise Dearman hosted a special launch party at the Prince Edward Theatre this morning to announce that they will be performing together professionally for the first time in a show called Kerry Ellis & Louise Dearman, Live In Concert… Together! on Sunday September 27th at Prince Edward Theatre. Although they have known each other for 20 years, they have not sung together since leaving Laine Theatre Arts in 1998. The pair will sing iconic duets, as well as solo numbers. The concert feature a live band and will be musically directed and arranged by Craig Adams. 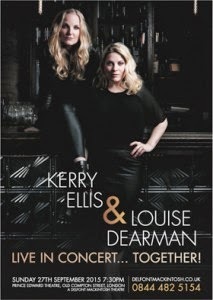 Tickets for Kerry Ellis & Louise Dearman.